Today’s recipe for Perfect Gluten-Free Pound Cake is the third installment of SSS … a Suite of Sweets for Sweethearts. 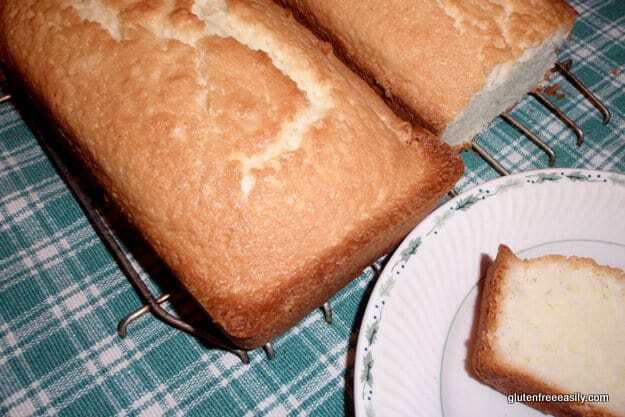 When I was growing up, pound cake was a family favorite. Bake a good pound cake and you were loved by all. Seriously. There was no gift I could give my grandmother (my dad’s mom) that she would have preferred over my pound cake. Grandma loved pound cake, and she said mine were the best. You see … before going gluten free, I made all kinds of pound cakes. There were classic pound cakes, orange pound cakes, lemon pound cakes, cream cheese pound cakes, chocolate pound cakes, and marble pound cakes … to name a few. Some were baked in tube pans. Some were prettiest if cooked in Bundt pans. Some were 8-inches square. Others were baked in loaf pans. Some were served plain. Some required a dusting of powdered sugar. Some needed a thin drizzle of icing. But, one thing they all had in common was how good they were. Everyone in my family and circle of friends had their own personal favorite of my pound cakes. I’ve been gluten free for well over 6 years now. I have not baked a really good gluten-free pound cake in that time (although I’ve tried several). Until … Now. Now I have the Perfect Gluten-Free Pound Cake for you! This pound cake recipe is another gfe recipe that uses olive oil as the shortening–in this case, light olive oil or extra light olive oil, and that’s an important distinction. (Extra virgin olive oil’s flavor is way too strong for this recipe in my opinion.) The original recipe is from the Filippo Berio site, which was also the source of the Mediterranean Chocolate Cake recipe that I converted to gluten free. I made this cake dairy free by using full-fat canned coconut milk, although you can use dairy milk if you like. However, I’m pretty sold on the moisture and dense texture provided by the coconut milk in this recipe. If you consistently eat dairy, this just might be one time you want to try eating dairy free. I made this pound cake for my dad’s birthday. Good thing the recipe made two loaves. Son was home for the weekend and ended up eating almost one entire loaf by himself, and then more from the second loaf later. He told me I should sell this cake in individual slices for $4 or $5 … “Mom, I’m serious. You could make a fortune.” And, he’s mentioned his love of this cake and his entrepreneurial ideas for me several times since. Before he headed home, he asked me to slice the remaining part of the loaf into individual pieces as a “to-go package” for easy eating while on the road. Then, he offered to deliver the remaining pound cake loaf to my Dad when he stopped by to say hello on his way out of town. Do I need to tell you what happened? He ate all of his to-go package before he arrived and then ate some more of Dad’s pound cake when it was offered. In case you need any more endorsement than that, please know that this cake is very easy to make and delightfully moist. All the previous gluten-free pound cakes I’ve made were dry the following day (if not later that same day), but that’s not the case with this one. Woohoo! If you are a not a fan of pound cake as a dessert by itself, feel free to top a slice with some fresh fruit (e.g., strawberries and whipped cream for a strawberry shortcake-type dish). Or drizzle a slice with your favorite chocolate or fruit syrup. You can even make an elegant pot of chocolate fondue, cut this pound cake into squares, skewer with a toothpick, and dip into that chocolate fondue. The results will be amazing! I even found another allergy-friendly chocolate fondue recipe at Go Dairy Free. I suspect it might be easy to make a fondue using the coconut milk left over from this pound cake recipe with some dairy-free chocolate. Enjoying fondue is such a fun thing to do for Valentine’s Day. I attended a party at Christmas where there was chocolate fondue. But, the fondue had already been cross-contaminated from folks dipping in hunks of gluten-containing pound cake, so it didn’t matter that there was fruit available for dipping. Admittedly, I was a bit disappointed that I could not partake, so I think having a chocolate fondue party for two would be something special for us to do on Valentine’s Day. I already know how special this Perfect Gluten-Free Pound Cake is! Don’t forget to check out the previous SSS entries … Surprise Mint Chocolate Chip Ice Cream and Cinnamon-Sugar-Crusted Popovers. I don't use the word "perfect" too often, but this recipe really does yield perfect gluten-free pound cake! 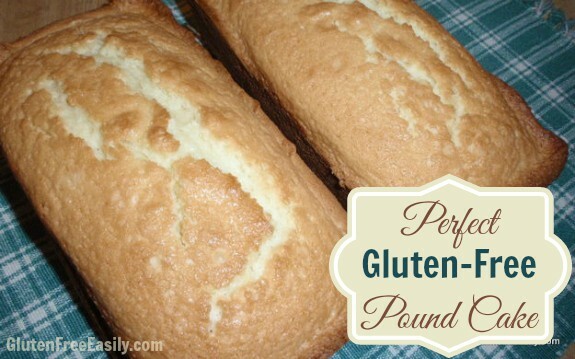 Honestly, even if you're not gluten free, you will find that this pound cake truly is perfect! Preheat oven to 350 degrees Fahrenheit. (See notes for adjustment for high altitudes.) Grease two loaf pans or grease and flour (use gluten-free flour) a Bundt pan. Combine flour, xanthan gum, sea salt, and baking powder in a medium mixing bowl. Set aside. Pour olive oil into large mixing bowl, and slowly mix in sugar, orange juice, and vanilla extract. Add milk. Mix 2 minutes. Gradually add dry ingredients into wet ingredients, mixing well. Pour batter into loaf pans or Bundt pan. Bake for 50 – 55 minutes. Reader Wendy lives at a higher altitude---6600 ft---and she adjusted oven temperature to 375 degrees with successful results. Coconut oil works fine in this recipe, but produces a cake that's lighter in flavor. I prefer the richer taste that the light olive oil provides. (Again, please do not use extra virgin olive oil in this recipe as the flavor is too strong.) Pans can be greased with whichever oil you use. Two loaf pans are what the original recipe calls for and what I used. Don't worry too much over the size of the pans, although you may have to adjust cooking times. The original recipe called for 6 3/4" x 3 1/2" x 2" loaf pans. I (and one gfe reader) used 8 1/2" x 4 1/2" x 2 5/8" pans. I don't taste either the coconut milk or orange juice in this recipe; perhaps they balance each other, but all I taste is "good." Last, I love the crunchy edges of this pound cake recipe. The end pieces are my absolute favorite. Originally published February 10, 2010 ; updated July 25, 2018. I so love this recipe. Hi Joy–It’s good to see you again! I’ve not made a lemon version but another blogger friend, Alta, of Tasty Eats At Home, modified my version to create a lemon pound cake. She said: “I followed Shirley’s instructions, subbing lemon juice for the orange juice, and adding 2 teaspoons of lemon extract. I also glazed the top making a simple lemon glaze – 1 cup of powdered sugar, about 1 tablespoon of lemon juice, and a few tablespoons of water.” Hope that helps! Hi Shirley. I would like to make pound cakes and others like bread. I,m Gluten Free and very very low sodium. can i omit the sodium in most bake goods. i can not fine a bread recipe that works for me. Starving for breads and sweets . Sincerely Margaret Fehrenbacher. Hi Margaret–Welcome to gfe. 🙂 I’m sorry but I have no experience in low-sodium baking of any kind. I asked a gluten-free blogger friend who excels at gluten-free bread if she had any input on baking low sodium with gluten-free bread and she replied: “I think she would need to cut back the liquid some (when eliminating the salt), but I’m not sure how it would turn out.” I’m going to ask your question on my gfe Facebook page to see if other readers have a good source of low-sodium bread and other baking recipes. Hopefully, I’ll get some responses and if I do, I’ll come back here to share them with you, Margaret. YUMM! YUMM! I love pound cake with strawberries and some whippy! Looks Delish! I don’t think I ever had a really good pound cake…even when I was eating gluten. I would definitely try this one when I’m eating normally again. 🙂 It looks nice and moist. Wow. Sounds wonderful. I only fairly recently came to love pound cake. When I was a kid, the only pound cakes I remember were store-bought…blech. Dry and forgettable. But the widow of our company’s founder and former CEO bakes all sorts of goodies for our company every Christmas, and before I went gluten-free, I remember having a lemon pound cake she made. Heaven. If I wanted to make a lemon version of this cake, how would you recommend I modify it? Should I sub lemon juice for the OJ, add some lemon zest, and drizzle with a lemon glaze? Oh my, I’m craving it already. Hi Alta–Thanks! Yes, I remember those store-bought pound cakes. Few things tasted more processed than those! Oooh, that lemon pound cake sounds wonderful. I think your ideas for making a lemon version of this recipe sound good. While I don’t advise tasting raw eggs, if you’re one who tastes cookie dough, you might even taste the batter to see if it’s lemony enough. The lemon juice is probably not enough to make a lemon taste unless you use dairy milk vs coconut milk (I think the thick coconut milk “disguises” the fruit juice added. But, the lemon zest and lemon glaze should do the trick nicely. I’m imagining the flavors right now myself … yum. Okay so I made this tonight. Several things – fyi, in your steps, you don’t mention when to add the sugar, juice, or vanilla extract. (I just added dry to dry, wet to wet.) Anyway, I made a lemon version – I used the zest and juice of 2 lemons. Also added 1 tsp of almond extract. I think next time I need to change up a few things. One, I added more juice than you called for, and I didn’t really up my dry ingredients. I also baked it in a single 5 X 9 loaf pan. I took it out at 60 minutes, but it was still underdone in the center. Should I have split the batter into 2 loaf pans of this size? Or maybe lowered the temp and just baked longer – with a bit more flour mixture, perhaps. Even still, the flavor in this cake was absolutely delicious. I am definitely making it again. Hi Alta–Thanks so much for the feedback; it’s always greatly appreciated. Yep, I see that I left out part of a step. The sugar, juice, and vanilla extract get added to the olive oil, but as you determined, wet to wet and dry to dry works, too. My sincere apologies for the omission … I’ve fixed it now. The recipe is designed for two loaf pans, and I just added more wording to make that clear. Because lemons vary in size and how much juice you can get from two equal-sized lemons even varies greatly, I like using measurements for the amounts of juice. (I’m the same when it comes to mashed bananas, etc. in recipes.) I just did some looking around at other lemon pound cake recipes to see how much lemon juice and zest were added. Of course, the amounts varied greatly. But, if you don’t want to adjust the flour amount (and I’d be hesitant to know the exact adjustment to make), I’d go for about 2 tsp lemon juice and 4 tsp lemon zest, for this recipe next time. A small amount of lemon extract could be added, too, to help add that little sharp pucker of lemon taste without adding extra liquid. Finally, if the cake still comes out with less lemon taste than you’d like, you could make a lovely lemon glaze with your remaining lemon juice. There are many recipes online, but just adding lemon juice to some confectioner’s sugar or mixing lemon juice and agave and heating/reducing until syrup thickness should provide a nice glaze to pour or drizzle over your pound cake. Hope that helps! I’m so very sorry about the glitches, but I’m thrilled that you found your cake “absolutely delicious” despite the difficulties. 🙂 I’ll be anxious to hear how your next one turns out! Thanks so much again Shirley. Well, my juice measured to 4 tablespoons, so that was part of it. The zest was nearly a tablespoon – but adding more zest would’ve definitely been the way to boost the flavor (and the yummy yellow lemon color!). I thought about lemon extract as I was tasting the batter…of course, I don’t have any. Anyway, wonderful recipe – and my favorite parts were the crusts too! One thing I have found helpful is to add frozen juice concentrates to recipes to get that intense flavor. Try a natural frozen lemonade concentrate (melted) in place of the juice. I have all of these ingredients at home, so I am soooo making this tonight! Thanks for posting this recipe. I am soooo excited to make it. I’ve been SEARCHING for the perfect GF pound cake recipe (to no avail), so I cannnnnnnot wait to try this. Thank you, thank you. I need to buy eggs and then I can get to work. I can taste it now. Yummmmm. Thank you for this recipe and all the others you have shared with us. My mother taught me a decadent way to eat pound cake, which would work great when it gets a little dry. She would toast slices under the broiler then spread them with butter. She also introduced me to hot fudge sundays, and whipped cream in coffee. Bad mommy! Pound cake for me only happens with fondue. I’ve never really had it as dessert though (although I have been eyeing a few lately ;D). This looks super yummy. Want to send me some? I’d be up for any type ;D.
One of these days when I’m ambitious again 😉 I’ll have to try this. I wondered if you could send me that link to the Easy Eats publication? Thanks for letting me know about that! Congrats to you too! I just made this, it’s soooo good! My (rather picky) 4 year old son can’t get enough of it! I’ve had a hard time finding a cake he likes (not that that’s such a bad thing)for birthdays, etc. He keeps coming back into the kitchen and asking for more. We’ll be having this along with some gf brownies, marshmallows and fruit with chocolate fondue sunday night. Thanks for the great recipe! Sounds like you have a very special and fun Valentine’s Day evening planned. Love that! Enjoy! Thanks so much for taking the time to comment with such good news! This pound cake is the real deal. I’ve been trying pound cake recipes since going GF and haven’t found one that comes close, let alone a dairy-free recipe. Who would have thought that olive oil and coconut milk are the secrets of wonderful GF pound cake?! You did, apparently. Thank you for a wonderful, wonderful recipe. The only downside is that I cannot stop eating it. The crust and texture are so impressive; this is my new cake of choice. Hi Jenn–I’m doing back flips here … such great news! I’ve been waiting anxiously to hear your feedback. 🙂 I’ve been learning that olive oil makes rich baked goods and I just used coconut milk because that’s my “go-to” non-dairy milk. And, yes, it just so happens that the combination makes for a great pound cake. Gluten-free, dairy-free baking serendipity. 😉 And, frankly, I’m still amazed that you can get two loaves of great pound cake from a recipe that only requires 3 eggs. Usually pound cakes require about twice that number. So another winning factor. Thank you so much for taking the time to let us know about your success! This is my husband’s kind of cake. Thanks. Thanks from him, too. He just doesn’t know it yet. Absolutely gorgeous pound cake! I imagine this would be very good with a strawberry or raspberry coulis on top of it too, though fondue is always tasty. So sorry that you can’t enjoy a lot of other flours, but it looks like this pound cake did just fine with rice flour and cornstarch! Hey Jenn–Nice to see you, and thanks so much! Every dish you make has star photo quality, so your praise makes me feel good. 🙂 Oh, yes, either coulis would be lovely and make this a high-end restaurant quality dessert. Even though I can’t tolerate the other flours, I’m sure you could use a healthier, but still “light” flour mix. I’ve found the white rice flour and cornstarch mix to work well in most recipes. I did just get some finely ground brown rice flour and plan to experiment with adding that into my flour mix some. I made this pound cake today, YUMMY! I live at 6600ft and the only adjustment I made for the altitude was to bake it at 375 instead of 350. This helps set the structure. Hi Wendy–Thank so much for letting us know! Great news! 🙂 I especially appreciate the info about the altitude adjustment. I’m going to add that info into the post, because it could be really helpful to others. I have been trying to figure out a recipe like this of years…I will be trying this on Saturday. I thank you and my family thanks you..
Hi Fire-Eyes! Awww, you’re welcome. 🙂 I’ll be looking forward to your feedback. Keeping my fingers crossed that your experience will be like all the other positive ones. BTW, Alta over at Tasty Eats At Home, even made a lemon version of this pound cake. You can read about the changes she made and see her drool-worthy photo here. Somehow I missed this recipe last month, so I’m glad you linked up this week. It looks delicious and I hope to give it a try soon. MMMM, pound cake! I can’t wait for strawberry season to accompany this. Looks delicious! Hi Brian–Thanks! I remember you making a pretty fine pound cake last year, too. 🙂 Strawberries are a great topping for pound cake. I’m ready for the warmer weather that will bring fresh strawberries! Do you think the recipe would work with ‘Pamela’s Baking Mix’instead of the gf blend, leaving out the baking powder since this mix already has it in it?? Wow Shirley! I just saw this post today, via The Cinnamon Quill, beautiful! This is precisely why I NEVER GET ANYTHING DONE! I have dropped what I was planning to do because I must now have pound cake! 🙂 Thank you. Have you ever used Ground Mace in a pound cake? I just was referred to your site via The Cinnamon Quill and love your sweet sense of humor. I am recently diagnosed gluten/egg/garlic(??) intolerant and am new to GF recipes. I wonder if you would be willing to try to alter a friend’s favorite sweet bread recipe? I will leave the recipe here and wait for a reply as to whether you are interested or not. Hi Toni–Welcome to gfe! What a very nice thing to say about my sense of humor—thank you! How wonderful that you came over from Jennifer’s blog, Cinnamon Quill … she’s one of my faves. 🙂 As far as your listing, when I was first diagnosed gluten intolerant, I was also diagnosed as intolerant to some other foods like onions, egg whites, and a few other strange ones that I can’t remember. I mention that since you are questioning the garlic intolerance. In my case, I didn’t eat those others for the first 6 mos I was gluten intolerant. Then I started reintroducing them. Most I have no isssues with now. Some doctors think that it’s the whole leaky gut issue and you’re going to test sensitive/intolerant to whatever you’re eating at the time … until you heal. Gluten stays off the table, but it’s possible that you may be able to eat the others another time. All that depends on what your doctor says, what type of testing you had, etc. I made this cake and it is fabulous!! The only change I made was to put it in a bundt pan. I greased and rice floured the pan. It took the same amount of time to bake. My family can’t believe that it is gluten-free. This is definitely my ‘go to’ cake from now on. Hi Shelly–Thanks so much for taking the time to comment and let us all here at gfe know about your success with my pound cake recipe! I love that you made it in a Bundt pan. I’m going to do that … maybe tomorrow as I have a birthday party for which I’m providing the dessert. 🙂 I love that I’ve given you your new “go to” cake recipe. That just makes my day! I can confirm that this recipe works wonderfully with the Pamela’s Baking Mix — I made it tonight and fed it to my (gluten-eating) family with strawberries, and we all loved it. I didn’t have any coconut milk on hand, so I used a combination of milk and Greek yogurt (trying to approximate the thickness of coconut milk) and it seemed to work. Since giving up wheat I have all but given up baked goods, as the GF stuff always seems hardly worth the bother and calories. But this I will definitely make again. Thank you!! I also used Pamela’s Baking & Pancake Mix. I omitted the baking soda and the xanthan gum as the mix contains both. I also used on-hand almond milk instead of coconut milk I didn’t have. It is definitely thinner by comparison but the cake baked up beautifully and was enjoyed by everybody at our Independence Day celebration. Next time I might just slightly decrease the oil to adjust for personal taste. Thank you for the fantastic recipe!! A solution to achieving a good lemony taste for pound cake is to use Boyajian’s Pure Lemon Oil in place of lemon juice and zest. I bought mine at Williams Sonoma but I’m sure you can find it elsewhere on the internet. It is extremely concentrated. It is also incredible when used in a lemon glaze. Thanks for your gluten/dairy/soy free baking suggestions. My husband is most grateful! Hi Selene–Welcome to gfe! 🙂 Thanks so much for the tip on the pure lemon oil! Of course, I had to search for it right away and found it at Amazon. I love the sound of it! I found that you can buy it individually or in sampler packs with orange oil and lime oil. All sound great to me! Key lime pound cake, perhaps? I like the idea of that, too. And, lemon glaze … ooh, must try. If I don’t get this from Amazon right away, I’ll certainly look for it the next time I’m at Williams Sonoma. Thanks so much for telling all of us at gfe about it, Selene! Thanks, too, for the kind words on my my recipes … it’s so rewarding to know that folks are finding the recipes helpful! All the best to you and your husband and look forward to seeing you here more at gfe! This pound cake is amazing. Not only is the crust excellent, but the taste and texture are wonderful – even the day after! I can’t imagine why anyone would want to dip this in fondue because it’s so good all by itself. When I greased the pans, I sprinkled sugar on it too. I read about doing that with another sweet bread and it’s pretty good – either straight sugar or a cinnamon-sugar mix. I also really appreciate the GFE flexibility of using whatever GF flour mix I have on hand. I don’t feel comfortable doing that when the recipe gives a specific combination of flours in a recipe. And whenever someone says to use their “special” blend, it always makes too much and then what do I do with the left over 1/4 – 1/2 cup of their special blend? I put it in GFE recipes!!! For this recipe, I used the authentic flour brand blend and reduced the xanthan gum by 1/2 teaspoon and in case I haven’t already made this clear, it made an unbelievably wonderful perfect pound cake. Thank you so much for this recipe!!! Hi Kathy–Thanks so very much for coming back with this delightful report on my pound cake! I use the cinnamon-sugar mix on my molasses banana bread and my special popovers, but haven’t tried it on pound cake yet. 😉 Bet it makes a lovely presentation, too. I’m so glad you are using and appreciating the gfe concept! It just makes life so much simpler, doesn’t it? I greatly admire folks who know all the “chemistry” of flours and like figuring out the best texture for each recipe, but I like to keep it simple for myself and others. I appreciate you sharing your variations on this recipe, and I’m tickled pink that you love it so much. I’m actually going to make this recipe for a neighbor a little later. Just made this today and it is SO good! Yum! I used a mix of rice flour and potato starch since that is what I had on hand. I actually am using it for a dessert for the 4th of July that calls for pound cake. I only used one loaf for that recipe, so I cubed up the second loaf and will use it for strawberry shortcake! I’m so glad I found this recipe. Thanks!!! All the best and happy 4th! WOW, WOW, WOW, Shirley!!!! This is amazingly delicious pound cake: so dense, moist, and perfect! Thanks so much for sharing the recipe. And, it looks like you are new to gfe–welcome! Thanks again … have a great weekend, DP! Thanks for the warm welcome, Shirley! You made my day when I made this a couple of weeks ago, so I’m happy to have made your day! I look forward to trying more of your recipes. However, I’m going to make the pound cake again this weekend and wanted to ask you if you have tried making a lemon version, either as part of the cake itself or with a glaze. Please advise as I’m not a very good baker. Thanks! I’m new to your site and so excited!!!!!!!!! Second question … Jules should work great, but Jules already contains xanthan gum so you need to leave that out. Hope you’ll do a test run before you share with others just in case the coconut sugar “behaves” differently. Otherwise, I know this pound cake will lift you to that master baker pedestal! Yes, even with a gluten-free pound cake. 😉 Like I said, fingers crossed on the coconut sugar. If I had some on hand, I’d give it a try right away myself. Happy Thanksgiving to you, too, dear! Shirley, forgive me for not reporting back right away. I made the lemon version, and it was amazing! the only problem I had was the icing being too watery, but adding more powdered sugar fixed that right up! I also made a version of the regular pound cake with butter, and it was to die for! I’m about to try your molasses pumpkin bread/cake and, if I have time, some cookies, too. Then I’m going to have to run a marathon to burn off all the calories! Am having a dinner party sat. and want to try the pound cake and use a reciepe on the none glut free cake you buy were you poke holes and add the milks to it and refrig. What do you think? Have you made it in a bunte pan yet? Hi vickie–Welcome to gfe! 🙂 I’m excited you’re trying the perfect pound cake; folks love it! First, while I personally haven’t made this in a Bundt pan yet, one of my friends did and she shared her experience in comments. Bottom line—she said it worked great. As far as your other question, it sounds like you want to poke holes and pour a glaze-like mixture over all to allow the glaze to seep into the cake. I see no reason why it woudn’t work. This cake is great on its own, but I *think* that should work fine. I can’t say for sure, of course. Best of luck and please report back to us all! I make this cake in a Bundt pan all the time. Works fine. I think your idea of using the pound cake as a base for Tres leche cake sounds like a great idea. I’ll have to try that myself sometime. Hi Wendy–Thanks so much for jumping in to help Vickie! I was obviously not connecting all the dots. 😉 Can you believe I’ve never had Tres Leches Cake before? Now it sounds like I need to make a Perfect Tres Leches Cake. 🙂 Thanks so much to you and Vickie for bringing up this topic! Hi Just made this pound cake but used granulated honey instead of sugar( easier to digest for diabetics) and I am glad it makes 2 loaves! My husband loves pound cake and he is now on a gluten free salt free diet. I did not put any salt in it and still came out moist and yummy! I think this would be great with strawberries for shortcake. Thanks so much! Hi Marjorie–It looks like you’re new here at gfe–welcome. 🙂 I’m so happy you had such success with your version of my pound cake! Even though we keep bees, I’m not familiar with granulated honey other than honey that has crystallized, but I don’t think you’re talking about that. Must investigate further–thanks! And you’re right, I’m sure this pound cake would be great as strawberry “shortcake.” Thanks so much for taking the time to let me know about your success, Marjorie! I loved your pound cake, Shirley! Yumm, it was wonderful! I posted pictures and rave reviews. Thanks for the great recipe and notes! I found this recipe via godairyfree.org, and we don’t have gluten issues, so I used regular AP flour and adjusted the temp for altitude. I only had regular EVOO, so that’s what I used. It turned out ok – certainly yummy, but I could taste the oil. The texture was perfection!! I just had to give it another go with the proper ingredients… but then I found sweet almond oil when I was looking for light olive oil, and I’m glad I took that chance. It turned out so yummy! We used it to make a school bus shaped cake for a back to school party. My daughter was so excited that she could eat any and all parts of the cake. Thanks again for sharing! OH boy. I am so sorry to report that I was very much like your son. The first one disappeared in record time, and the 2nd soon followed. Feeling bereft when there was no more poundcake, I made 2 more. Then 2 more. I wish I could report that we ate pound cake for weeks, but WEEK would be more honest. My non-GF honey was eating it just as fast as I was, and NOW we know what to serve those guests so I don’t have to make two desserts! Thanks so much for taking the time to leave this delightful comment! I made this for my father’s birthday, and everyone loved it! I thought I’d drop in to show you that I do come to your website frequently. And that poundcake – I’ll report back after the weekend how it turnes out! The only thing that’s holding me back from whipping up a batch right this moment is that I don’t have all the ingredients – otherwise I would be in the kitchen even at this hour! 🙂 Thanks Shirley! Hi! I used your pound cake recipe as the base for cake in my mock TastyKake Peanut Butter KandyKake recipe. Gluten and dairy free! 🙂 They are amazing!!! Hi Jenn–I was tickled pink to read your comment when it arrived in my In Box! I absolutely LOVE that you were able to use my pound cake to create some amazing treats of your own! They look and sound phenomenal. 🙂 Thanks so much for sharing that news with us! Whow! Whow! Whow! Just made this pound cake, and it was outstanding! Soooo good! Shirley, this was fantastic! It tasted so good, and I also love your simple gluten free flour mixture, it works well and it doesn’t give the cake any “weird” taste. My family loved it as well, and so did every person that was lucky enough to get some. Will make this a lot – pound cake is one of my very favorite things to bake! Thanks for reminding folks that this recipe works well in a Bundt pan, too. Others have said that and it definitely makes for a great presentation. The most unique presentation though came from one reader who turned the loaf into a school bus cake for a Back to School party! Clever and fun, huh? ..and I made it in a Bundt pan simply because I didn’t have a loaf pan – it turned out perfect! I’m so glad to find this! I enjoy making cakes for my daughters’ birthday parties and i’ve wanted to try making a GF cake, but was concerned because they really need to be pound cake density. Now to find a healthier icing that still works for decorating! Absolutely amazing cake! I am not only GF but rice free. I had to make some ‘modifications’ to this as I’m also allergic to olives (so no olive oil!). I used Bob’s Red Mill GF Flour, vegetable oil and used lime juice (I was out of orange). I was also out of full fat coconut milk so I used almond. Just awesome!! My daughter who is not GF said she couldn’t tell it was GF!! I have searched now for almost a year for a cake that we could use for a tier in my other daughter’s wedding cake and I think we have found it!! She will be home in 2 weeks for her birthday (she’s away at grad school!). I can’t wait for her to try this!! Thank you so much!! Hi Maureen–Welcome to gfe and thanks so much for taking the time to leave such a wonderful review! 🙂 This recipe is definitely a favorite recipe at our house and it’s also loved by my support group members and readers. And you’re right, folks use this recipe for all kinds of other desserts … cupcakes, fondue, shortcake, and much more. I guess you will make two loaves next time 😉 … enjoy! how much should i use if i wanted to use butter instead of olive oil. Hi sam–I have no idea how this recipe will turn out with butter as it truly is perfect made with olive oil. However, you could use this substitution chart to see if you could go the other way. Please let me know if it works out. Ok tried it with butter and halved the ingredients. It’s tasty ! But it was half biscuit like (crunchy) . Have any idea what could be the reason ? And could you please tell me which brand of coconut milk you use? To put it in a better way. Browned on the sides and undercooked in the middle . Hi sam–Well, I’m sorry that using butter didn’t work out perfectly for you. This is an example of why bloggers and recipe creators are reluctant to offer suggestions. There can be so many variables and we just don’t know if every substitution will work without having tried each ourselves. I’ve successfully used all brands of full-fat canned coconut milk in this recipe. Did you use canned coconut milk? Did you use the full-fat kind, not light/lite? What type of flour mix did you use? Some flour mixes are too heavy and will give a biscuit like texture and will not rise enough to cook through the middle. Those are my thoughts right now. Oh, also, is there a reason you don’t want to use olive oil per the recipe? Yay! so happy to have found this recipe! If I am using a gf baking mix (like pamela’s) should I eliminate the xanthan gum? Btw, I read a few of your posts over at your blog, Seaweed Snacks, and really enjoyed them! For example, yay for wandering skunks that don’t spray. 😉 And thanks for sharing the lesson of “so what.” I really appreciate that one, as I could see its benefits for both tough times in life and “every day” annoyances. I just made this today for my CSK (community supported kitchen) shares and it has already gotten amazing reviews! It turned out perfect!! Hi again Jessica–That’s such wonderful news! And I am intrigued by your CSK shares … so you guys bake for each other, too? I so appreciate the “perfect” review, dear. Hi, Shirley! I’m really wanting to try this recipe but I can’t handle that much sugar. What do you think would work in place of the sugar? And can I use just water instead of orange juice, we don’t normally have orange juice on hand. 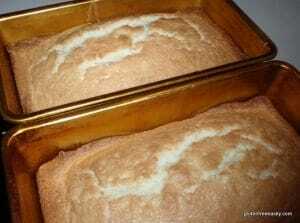 I really miss pound cake and this looks yummy! Hey Susan–I suggest reading through the comments to get some ideas about sugar replacement. I used this recipe as the starting point for my Cinnamon Swirl Coffee Cake recipe. In that recipe, I used brown sugar and less of it. I have had great success with using coconut or palm sugar, and sometimes in lesser amounts, but admittedly haven’t tried this recipe with coconut sugar yet. You could use lemon juice or lime juice (as one reader did) in place of the orange juice or probably just omit it or add another liquid (more coconut milk perhaps?) in its place. That adds a nice subtle flavoring, but I don’t think it would be a show stopper to omit it. So, in summary, I think you can definitely make a few adjustments and make this recipe work for you. Be brave! Even if you don’t get it “perfect” the first time, I’d sure it would still be edible toasted and/or with some jam, etc. 😉 Please report back on your experimentation! Hey, Shirley. I made it with coconut sugar and it tastes great but it fell shortly after I took it out of the oven. Now it’s about half the size it was when I pulled it out. I used a flour blend that has sorghum and millet flour in it. Could that be too heavy? Hi Susan–Thanks for reporting back! I’m glad that your pound cake tastes great, but so sorry that it fell. 🙁 Those are heavier flours for sure, but it might be a combination of the effect of the flour and the effect of the coconut sugar. A little more of the baking powder might help with the left or a lighter gluten-free flour mix as you indicated. Another idea would be to just make pound cupcakes. The falling fighter might be less (or less noticeable) in that form. I’m so sorry your version didn’t work out exactly as we’d hoped. Hi, Shirley! I figured out what I needed to do to get the coconut sugar to work. I used your lighter flour blend and the coconut flour but it still fell. So, I decided that it has to be the coconut sugar, it’s too heavy. I tried it again with the lighter flour but I measured out the coconut sugar and ground it down almost to a powder and increased the baking powder a pinch. Perfect! I baked it as a bunt cake and it’s beautiful! Thought I would let you know how it all turned out! How can I make this poundcake in my breadmaker? Hi Gina–It looks like you are new here at gfe–welcome! 🙂 Unfortunately, I cannot answer your question. I have never used a breadmaker and don’t know that it would work for this recipe. Out of curiosity, I googled baking a pound cake in a breadmaker and saw where some had done so successfully, but others had disasters attempting that. The key seemed to be whether one’s breadmaker had a “Cake” setting so the kneading process could be skipped (at least that’s what I surmised from my quick investigation). I’d suggest searching online and reading what others have done, as well, as looking at your breadmaker’s instructions for baking pound cakes. Please let us know if you try it and get it to work! Hi Shirley! Thanks for the quick response. Yes, my breadmaker has a “cake” setting. I bought a bag of Bob’s Red Mill vanilla cake mix and added 3 large eggs, 1/2 cup of milk (instead of water) and 1/2 cup of vegetable oil. I also added a pinch of vanilla, almond and lemon extracts, as well as a 1/4 cup of white sugar (didn’t think the batter was sweet enough) and about a 1/4 to 1/3 cup of mini chocolate chips. I walked out the door leaving it on the cake setting (manually set to knead for 17 minutes) and hoped everything turned out well when I arrived. When I arrived home, I saw a beautiful pound cake in the bread maker. It looked as if I took it right out of the oven. Now I just need to figure out how to make it from scratch….but at least this was a win-win situation for a gluten free cake on the first try and was absolutely delicious. Almost gone within a few hours…….and NO, I wasn’t the only one eating it….LOL. Hi again, Gina–Well, I’m not as quick this time. 🙁 So I guess you can’t skip the knead option? I’m so glad you had success though. It seems that method should work well with my pound cake recipe, too. Good luck! I just discovered this site… and this recipe! I made it today as a trial for my glutenous son’s birthday. His brother and I are both GF/CF and I didn’t want to have to make two separate desserts. This pound cake is amazing! I only had EVOO (not light) and I could taste the olive oil, but neither of my sons could. I used the King Arthur Gluten Free All Purpose Flour. We (well, mostly I) ate one whole loaf today and I used the other pound cake to make a baked alaska using coconut milk ice cream, with a layer of chocolate shell (coconut oil and chocolate chips), and strawberry preserve filling. YUM! My glutenous son said it was the best birthday cake he’s ever had! And it was gluten and dairy free! Thanks so much! Next time, I’ll use light olive oil, but my sons both said I shouldn’t ever change a thing! Thanks again, Debra. I hope you find many more gfe recipes that you and your family love! I must say- this Pound Cake was absolutely, surprisingly amazing! I never have to create any foods gluten-free but I just hosted a bridal shower where the bride was alergic to gluten and is lactose intolerant and this was perfect and was absolutely amazing. Hi DakotaW–Welcome to gfe! 🙂 And what a wonderful review–thanks so much! I’m tickled pink that you were able to make my pound cake for your friend’s bridal shower. It is truly a gift when friends take the time to make delicious and safe food for those of us who eat gluten free (and more free). Seriously, I’m sure your friend appreciated your kindness more than she could ever express. Thanks again for taking the time to share your review! Just thought I let you know that we are still having a love affair with Shirley cake, and make it quite frequently! As a matter of fact, I am currently working on the re-creation of a childhood favorite that uses poundcake as a base…..will report back when I have some results and pictures to prove it! You keep on being awesome! Thanks! “Shirley cake” and give up everything else? 😉 Can’t wait to see what you are planning next! Hello. I made this cake today (I used canola oil as I didn’t have olive oil) and it turned out really well. There was no taste of coconut or orange, just like you mentioned. It just tasted “good”. I’m glad I found your dairy-free pound cake. Thanks! Now this is what pound cake is supposed to taste like! We had this for the first time yesterday and are making it again today! Yesterday we added a layer of cinnamon and chopped walnuts in the middle and today’s we are leaving plain to have with baked custard and fruit salad at brunch tomorrow. Sooo good! Can you make this with butter? I’m making it for a gluten-free friend for Christmas and want to make it a little richer tasting. Thanks! Hi Rhonna–Welcome! 🙂 Have you made this recipe as written yet? This pound cake made with the light olive oil is really nicely rich “as is.” I *think* one person made this recipe with butter and subbed “one for one.” The makers of olive oil don’t recommend a one-to-one substitution going the other way (oil for butter). You can see their substitution chart here. So all that said I really am not sure about the butter substitution. Sorry I can’t be more helpful. That’s great to know, Rhonda! Best of luck on your experimenting with a butter version. 🙂 Please let us know later how it all went! I just tried this “Perfect” Pound Cake recipe and lets just say it doesn’t get more perfect than this amazing cake!!!! With the simplicity of the recipe and how different it was from my traditional wheat based recipe I had doubts, although your pictures were very enticing. I can’t believe how much it tastes exactly like regular pound cake, in fact it’s a better version of what I remember pound cake to be! I actually experimented and used egg nog for the dairy in the recipe and added more nutmeg hoping it would take on a mild egg nog flavour. It turned out great the flavor is very mild but still can be picked up on without being too much. Thank-you SOOOOOOOOO much for sharing! Hi Kristen–Welcome to gfe! Oh, how wonderful it is to read your review of my pound cake. 🙂 I love the idea of using egg nog in this recipe. I’m imagining the wonderful flavor that’s just right and not too strong. 😉 You might want to check out my fudge recipe in which egg nog can be used instead of milk. All the best … happy holidays! Hi Shirley – I cannot wait to try this GF version. Pound cake is one of my favorites, and so versatile with the flavors you can add! My grandmother, who passed away several years ago, made the best pound cake ever, and now my mom makes them, but of course I can’t eat them. I am so excited to try this as a plain pound cake, then a lemon version and a coconut version! Thanks again for all of your hard work for those of us GF foodies! Evaluation of workers exposed to xanthan gum dust found evidence of a link to respiratory symptoms. On May 20, 2011 the FDA issued a press release about SimplyThick, a food-thickening additive containing xanthan gum as the active ingredient, warning “parents, caregivers and health care providers not to feed SimplyThick, a thickening product, to premature infants.” The concern is that the product may cause necrotizing enterocolitis (i.e., NEC). As of July 10, 2012 the FDA has not established the causal link between SimplyThick and NEC. Xanthan gum may be derived from a variety of source products that are themselves common allergens, such as corn, wheat, dairy, or soy. As such, persons with known sensitivities or allergies to food products are advised to avoid foods including generic xanthan gum or first determine the source for the xanthan gum before consuming the food. Specifically, an allergic response may be triggered in people sensitive to the growth medium, usually corn, soy, or wheat. For example, residual wheat gluten has been detected on xanthan gum made using wheat. This may trigger a response in people highly sensitive to gluten. Some consider this to be a separate allergy to xanthan gum with similar symptoms to gluten allergy. Xanthan gum is a “highly efficient laxative,” according to a study that fed 15g/day for 10 days to 18 normal volunteers. Some people react to much smaller amounts of xanthan gum with symptoms of intestinal bloating and diarrhea. There are many substitutes for xanthan gum when used for baking such as guar gum and locust bean gum. Manja–Thanks for the info on xanthan gum. Folks will have to read, do their own research, and make their own choices on whether or not they wish to use it. As far as the laxative effect, personally, I’ve found that to be much more of a problem with guar gum. Hi Stephanie–I am thrilled when folks Pin my images on Pinterest because that action does draw traffic to my site. I asked that you remove my recipe that had been cut and pasted into the Pin description. That’s a totally different thing. Both my recipes and images are copyrighted, but with Pinterest, yes, the images get used. But recipes should never be reprinted anywhere without permission of the owner. And if the recipes are on Pinterest in full, there’s no reason for anyone to visit my site at all. 🙁 Pinterest reduced the number of characters in its description field to stop users from cutting and pasting recipes because it is illegal. Despite the character limit, ingredients and instructions are now getting abbreviated and still shared in the descriptions. Legally, you can only print recipes on Pinterest if they are your own recipes. (Read more here.) I hope that makes sense to you. Again, I thank you for pinning my image, but please refrain from sharing my actual recipes on Pinterest. Hi again, Stephanie–Thank you for being so honest, and for being so understanding now that you see how saving a recipe in that manner is a problem. I get where you are coming from. You’re right that occasionally blogs disappear. There are a couple of options like joining Ziplist so you can save recipes (although I only recently joined ZipList so many of my recipes—including this one—are not yet in the program), printing out recipes so you’ll have them later (admittedly “old school”), cutting and pasting recipes into a file on your computer, and I’m sure many more. I hope you figure out one that works for you. I really do appreciate your support! I tried this recipe with the following changes: coconut oil instead of light olive oil, lemon extract instead of vanilla, and lemon juice instead of orange juice. It made a nice “lemon loaf” and I will definitely make it again. Thanks for a great and easy recipe! I have come back at looked at this recipe over and over. It looks delicious and “normal”. I am new to all of this gluten free as I was just diagnosed late March 2013 as having celiac disease. I think I have been like a deer in the headlights……I haven’t really tried to get back in the kitchen and try my hand at making good gluten free recipes. I attempted a batch of cookies that went directly in the garbage. I am committing myself to making this recipe this week. Wish me luck! I made this today and it is everything you said it would be. Thank you for the recipe and my first success at gluten free baking! Yay!! Hi Brenda–First, welcome to gfe! 🙂 Second, I’m sorry I didn’t reply to your first comment on this post. Last, I’m thrilled that you this pound cake is your first success at gluten-free baking–congrats to you!! For someone who was just diagnosed in March, to be baking successfully already in May is just terrific! I see much more success in your future. 😉 Thank you so very much for taking the time to comment. I was dying for chocolate pound cake so I adapted your wonderful recipe by replacing 1/4 cup of the flour with Dutch-process cocoa powder and the juice with more milk. It came out perfectly! Hi mydecembr!–Welcome to gfe! 🙂 And thank you so very much for sharing your chocolate version of my pound cake! I love that! Will have to share on my Facebook page and add to notes. Oh, and of course, try myself very soon (once the current heat wave passes). 😉 Thank you, thank you! I try various GF recipes with sometimes minimal success but I have never made your Perfect Poundcake that is wasn’t a howling success. I have also made a chocolate version and can’t keep my granddaughter out of it. Thank you so much. Hi Sandy–It looks like this is your first time commenting on gfe–welcome! 🙂 And what a terrific review of my recipe–thank you so much! I understand the issue with your granddaughter … the original of this cake is pretty addictive, so I can only imagine the chocolate version. Could you please tell us how you make your chocolate version? Oh man oh man. Just made this and my non gf parents and I just ate a whole loaf. It was fantastic! I hadn’t had pound cake before and I am glad I skipped the bad versions and got right to this! I am looking forward to look through your other recipes. Thanks! Hi! This recipe is in my oven right now:) I’m excited! I couldn’t see the need for 2 pans. IDK, the amount of batter didn’t seem to warrant 2. Maybe because I’m used to Bunt pan size….. Anyhoo I used a mini pan & a 9×5. I’ve wanted to try a recipe without butter but couldn’t find one & I’m not good at experimenting. Hi regee–Welcome! Hope you had great results, even with downsizing one pan! My pound cake batter easily fills the two regular-sized loaf pans after baking, so I hope you still had great results. 🙂 Please let us know if you get a moment. I wanted to let you know this recipe turned out GREAT!! I took it with me on my 6wk. vacation & I even had a piece for the plane trip home!! I wrapped it and kept it refrigerated. I toasted each slice usually, but also heated in microwave a couple times. I’ll definitely be making this again!! I was wondering if there has been any success with using egg replacer. We are under huge restrictions due to food allergies. Think vegan (not by choice) and gluten free. I didn’t notice anything in the comments about replacing the eggs. Thanks! Hi Brandy–Welcome to gfe! 🙂 Unfortunately, none of my readers have reported back that they’ve used egg substitutes in this recipe. I’ve read that commercial egg replacer usually works best when no more than two eggs are replaced. You could go ahead and give the recipe a try with that or halve the recipe to make only one loaf with better chances perhaps. Please report back on your results if you give it a try. Fingers crossed! I am trying to starting to cook gluten free. You refer to pour and I do not get a pouring solution from this mix. Should it be where you can pour or like a dough mix? Hi Peggy–Welcome to gluten-free living and welcome to gfe, too! 🙂 The recipe creates a pound cake batter (like any other pound cake–or cake, in general–batter) so I refer to pouring the batter into the pans. You still will need a spatula to help with getting all of the batter out of the bowl though. Hope that helps! Enjoy! this recipe sounds yummy. However I eat egg free also. What would you sub for the three eggs? Hi Tamla–Welcome! 🙂 Unfortunately, none of my readers have reported back that they’ve used egg substitutes in this recipe. I’ve read that commercial egg replacer usually works best when no more than two eggs are replaced. You could go ahead and give the recipe a try with that or halve the recipe to make only one loaf with better chances due to less of the commercial substitute perhaps. Eggs are usually key to pound cakes. I did find this substitution for eggs on a pound cake recipe on Living Without’s site: “For Egg-Free Pound Cake, omit 2 eggs. (1) Add 2 tablespoons arrowroot + ½ teaspoon additional baking powder to flour mixture. Mix well. (2) Heat milk just until warm and add 2 tablespoons flax meal; let sit 5 minutes to thicken. Add to butter and sugar. (3) Proceed with recipe instructions. If batter seems too thin, add 1-2 tablespoons additional flour blend.” Please report back on your results if you give either of these methods a try. Fingers crossed for you! Hi Sandra–Substitutions can really impact a recipe, sometimes adversely. I recommend the light olive oil; the results are superior to using other vegetable oils. But others have reporting using canola oil successfully. What specifically did you use for rice flour or your gf flour mix? white rice flour? sweet rice flour? anything else? Did you add xanthan gum? Thanks, Shirley. I used sweet rice flour (superfine). Is that the same as Asian? Using that, I did your ratio of rice flour to cornstarch (3 parts/2 parts) and then measured out the amount needed for the recipe. I did use xanthan gum. Forgot to mention: I did not have orange juice, so I left that out. Sandra–That was your issue! While sweet rice flour IS an Asian rice flour, it is not the same as white rice flour. Sweet rice flour is also called glutinous or sticky rice flour, not because it contains gluten, but because it is so sticky (like gluten) and GUMMY. Very gummy. Usually you only need a small amount of sweet rice flour when you use it. There are a few exceptions. Folks use it by itself to make gravy for example. But otherwise in flour mixes, only a small portion would be of sweet rice flour if it is included in the mix. The mix you’ve made will NOT work, except for something like gravy perhaps. You need to buy Asian white rice flour. 🙂 Leaving out OJ doesn’t really matter much. Thank you, Shirley. I’m actually relieved. 🙂 I just have a small amount of that mix left, so I’ll save it for gravy. Thank you! I do have some “white rice flour” here. I think this is what I have. http://www.arrowheadmills.com/product/organic-white-rice-flour Would that work in your mix? Also, do you have a favorite place that you purchase your Asian rice flour? I’m really needing to keep costs down. I’ll definitely have to look into an Asian grocery store. Thanks for everything! I just made these and subbed Egg Nog for the milk, it was DELICIOUS! I have been searching for a great gf cupcake recipe with little success. Has anyone tried this batter in cupcake liners? Hi Korina–Welcome to gfe! 🙂 Folks have reported to me that they’ve used this recipe for cupcakes and they loved them! Because it’s a pound cake recipe, the cupcakes will have that density and not be as light as regular cupcakes, but they are totally delicious. I also have a Coconut Blueberry Pound Cupcakes recipe. This looks so good… I have a question tho, what can I use in place of the AP gluten free flour if I don’t have it on hand? I have many other GF flours in here other than that..
Is it possible to replace the gum with powdered pectin? Would it be 1:1? Also do you have any ideas on egg replacers? Applesauce? Thanks! I’m excited to try this recipe! Hi Rebecca–I think I went off to investigate pectin after you commented and never found my way back. 🙁 I’ve never worked with pectin in place of xanthan gum. And, I’m sorry, but I don’t recommend making this cake without eggs. Pound cakes depend upon eggs. Others who live egg free (and gluten free) have made their own versions of pound cakes, so it’s probably best to try out those recipes. Sorry I couldn’t be more helpful as it is a great recipe. No success here – whole cake and was uncooked even after 90 mins in the oven. Brisie–I’m sorry to hear that. Did you change any of the ingredients? What gf flour did you use? I know this is an older post and maybe I’ve already commented, but this really does look amazing. I just saw it again via Kim on Facebook and I started craving strawberry shortcake made with this pound cake, fresh berries, and whipped coconut cream. I also want the Athleta yoga top featured on your side bar. Oh my gosh, it is so cute. Strawberry shortcake and then yoga! Maybe the other way around. =) Perfect. Hi Melissa–Awww, thanks for popping in and leaving this lovely comment, dear! It was actually National Strawberry Day last week, which seems crazy in the middle of winter, but anything that makes us think of sweet and juicy strawberries, Strawberry Shortcake, pound cake, and warmer weather is not a bad thing at all. 😉 I can see and taste strawberry shortcake right now thanks to your description. And whipped coconut cream … now that’s my favorite topping. 🙂 And that’s so nice of Kim to share! I don’t always get notifications when folks do that on FB, so I’ll have to thank her. Hi Shirley… would you by any chance have the weight measure for your 2 1/4 cups flour mix? Hi Richard–Welcome to gfe! 🙂 I don’t usually deal with weights to be honest, but it’s such a simple mix that I decided to see if I could look up the info online. What I read is that both finely ground white rice flour and cornstarch weigh 135 grams per cup. Cornstarch is actually 135.26 per what I read, but the cornstarch is the lesser of the two in this mix so if we go with 135 grams per cup times 2.25, we get 303.75 grams. Hope that’s helpful! If you give the recipe a go with that amount, please let us know how it works out! Can you use the same amount of coconut flour in this recipe? Hi Rhonnna–It’s good to see you again. 🙂 Sorry, but coconut flour will not work as a substitute for the gf ap flour mix in this recipe. Coconut flour is quite a bit different than gf ap flour and requires more liquid and/or different or other binding ingredients. I’d look for a pound cake recipe that already uses coconut flour as it would be created with those special factors in mind. Decided to skip the coconut flour…but thanks for responding so quickly. I’ll have to find some recipes with coconut flour though, because I bought quite a bit at Costco! I would like to use your recipe for to make a gluten free almond pound cake (and add buttercream frosting) for my friend’s wedding cake. Do you have any suggestions on how to modify your recipe? Would almond paste be the best flavouring? Do you have any good buttercream recipes as well? Thank you! Made this tonight for strawberry shortcake. Absolutely delicious! I substituted the orange juice for pineapple juice just because it’s what I had. Fantastic! Definitely a repeat!! Shirley, your recipe for pound cake is the best! I probably gained 2 pounds today because I couldn’t stop eating it. The end pieces were so darned delicious I ate two of them by themselves plus an inside slice with strawberries and whipped cream. FYI; for the flour, I mixed the GF all-purpose flour mixes I had left over from each of three other GF bloggers recipes. It worked out great. Thanks for a wonderful recipe. Hi Ronalyn–Thanks so much for taking the time to leave this delightful comment! 🙂 Like you, I am crazy about those end pieces. LOL How wonderful that your “mega” mix of all-purpose flour mixes worked just fine, too! Last, a belated welcome to gfe. Happy to have you here! This is my favorite pound cake ever – I’m GF and my daughter is dairy and soy free (among other food allergies). Everyone likes this cake, even if they are not on a restricted diet. I find I have to bake mine longer than the recipe directs but ovens do vary. I use the “toothpick test” and it comes out nicely every time. Thank you for sharing your pound cake recipe. I used it as a base recipe to create a sugar free version as I am diabetic. I also used polenta for half the flour, and poured a syrup made from lemons and stevia on the loaves whilst still warm, giving an Italian feel to the cake. Following the amounts in your recipe exactly gave me an excellent result! Hi Clare–Welcome to gfe! 🙂 I love that your were able to make a variation that works for you. It certainly sounds delicious! 🙂 Thanks so much for taking the time to comment and share with us all. I have just been placed on the FODMAP diet for irritable bowel when pintrest lead me to this recipe. I was about to give up on baking for myself when this baby popped out of the oven. Talk about heaven! Using my own basic flour blend of equal parts rice/corn/millet flours, its just fantastic! Going to be using it as my base for all muffins and cakes from now on. Thank you so much from sharing! Made your recipe today and oh my gosh, I AM IN HEAVEN! First REAL pound cake tasting pound cake I’ve had in 10+ years, literally! Made it a lemon cake, using 3 t. fresh lemon juice, 3 t. zest & 1 t. dried lemon peel for extra zing. Used coconut oil for the first time too. Terrific! Have some late season peaches all ready to serve with it tonight. Thanks for your inspiration! First, welcome to gfe, MaryLynn. Second, yippeeee on all your success making my pound cake work for you! 🙂 How much xylitol did you use? I want to share your comment on my gfe Facebook page and I’m sure that question will be asked. 😉 Thanks so much for taking the time to share your wonderful review and the details on your substitutions! I know I’m about a year after you commented, but wondering what measure of xylitol you used? Was it 1:1 and was it pure xylitol or a blend ? Needing a lower carb option. Tried it with Stevia in the Raw but it was a fail. Tasted good, but didn’t rise. Thanks! Are you kidding me?!!! I can’t even BELIEVE how good this is! I really just am in total shock at how easy & simple & inexpensive & GOOD this cake is. My 7yo said, Mom, you should make MORE gluten-free stuff!” Well, I think I will 🙂 THANK you! Hi Erin–Welcome to gfe. 🙂 Your wonderful comment made my day when I read it! I keep telling folks about this cake in the hopes that they will come to the same delightful and delicious conclusions that you did. 😉 So, so glad my pound cake was a hit with you and your family! Thanks for taking the time to leave such a lovely comment! Thank you so much for this amazing recipe! It really does not look or taste glutenfree! All the best! quite the line up reviews on this one Shirley!! Featuring your recipe this week on Allergy Free Wednesday! I am so happy to have found your blog — and this pound cake recipe — through Allergy Free Wednesdays! I also grew up eating lots of homemade pound cake that my mom would make. I remember dunking slices in a cold glass of milk… Mmm! She made the best plain, lemon and chocolate pound cakes. When she passed away, I inherited her recipe box and found that she labeled her chocolate pound cake “Karen’s Chocolate Pound Cake.” She knew it was my favorite. I’m going to start following your blog and hope to find a recipe for gluten free chocolate pound cake some day! Hi Karen–Welcome to gfe! 🙂 So happy that you found my site through Tessa’s AFW post! I so agree on the “mmmm” on pound cake. I’m sorry that your mom is no longer with you, but how wonderful that you inherited her recipe box with her very own chocolate pound cake recipe. Very special indeed! I bet it would be pretty easy to convert your mom’s recipe to gluten free. If you want to email it to me, I’d be happy to give it a go and share it with you and here on gfe when I’m successful. 😉 Just email me at glutenfreeeasily[email protected] if that sounds good to you! Thanks so much for taking the time to comment and for following gfe! Thanks for sharing a gluten free pound cake for Hearth and soul blog hop, Shirley, Pinning and tweeting. I haven’t had a pound cake since going gluten-free. This sounds sooo good. Thanks for sharing it at Savoring Saturdays! I made this pound cake this weekend! The taste of the bread was fantastic! However, I tried to substitute the egg to egg replacement and I don’t think it worked as nicely! Could you please help me to adjust this recipe so it can be vegan as well? Hi Michelle–Welcome to gfe! 🙂 While I have quite a few egg-free, vegan recipes and others where the usual egg subs work here on gfe, this recipe has not been one of them to date. Long ago, I had shared the following idea from Living Without magazine (which is now known as Gluten Free and More): “For Egg-Free Pound Cake, omit 2 eggs. (1) Add 2 tablespoons arrowroot + ½ teaspoon additional baking powder to flour mixture. Mix well. (2) Heat milk just until warm and add 2 tablespoons flax meal; let sit 5 minutes to thicken. Add to butter and sugar. (3) Proceed with recipe instructions. If batter seems too thin, add 1-2 tablespoons additional flour blend.” My recipe calls for 3 eggs, so you’ve have to adjust the arrowroot, baking powder, and flax meal amounts accordingly if you want to give this method a try, plus it uses oil vs butter, of course. Please let us know your results if you try this method. Good luck! This recipe looks amazing. Best GF pound cake I have found in my search….Perhaps you could help me with this….I can’t eat dairy or eggs. I have tried several different egg substitutes, flax eggs, chia eggs….but have been disappointed in the result. Have you a tried and true method for substituting eggs when baking? Thank you! Hi Rachel–Welcome to gfe and thanks for the kind words! 🙂 Egg substitutes are an interesting thing. Different methods work better for different types of recipes. As one is learning this info, it’s usually best to use the recipes of folks who already have made successful egg-free recipes. As you’re both dairy free and egg free, I really recommend following some gluten-free vegetarian or gluten-free vegan bloggers (e.g., In Johnna’s Kitchen, Free Range Cookies, Ricki Heller, Unconventional Baker, and She Let Them Eat Cake) as they have many baking recipes that will fit your needs. I have some egg-free and vegan recipes, but not a huge percentage. As far as this particular recipe, it’s already dairy free, of course. But as far as an egg substitution, eggs are really key to pound cakes, and substituting for more than two eggs and having good results can prove difficult. Folks who do have success subbing for more than two have told me that they usually use two egg subs at once in this case. So they might use two flax gel eggs and one chia gel egg. All that said, I’m sorry, but I’ve not made this recipe with any egg substitutes. If you give it a try, please let us know. This is hands down the BEST pound cake I’ve had in forever, and it’s gluten free…YAY…hadn’t been able to find a good recipe for gluten free pound cake, but for some reason it just sounded right, and IT WAS. Thanks for all your research into compiling this wonderful recipe. It is Christmas Eve and I made it for our family dinner tomorrow, along with some traditional ambrosia (not the kind with sour cream or whipped topping), the kind where the juices make it divine, and it will be so good drizzled over that pound cake tomorrow. And I dare anyone to know it’s gluten free…that’s how good it is. Merry Christmas and have a blessed day. Merry Christmas and a Happy 2016, Wanda! I love this recipe (even shared with my non-GF friends) but am asking for help in making this a lemon pound cake. I can not seem to get it right. Hi Larry–Welcome to gfe! While I have not made a lemon version of this pound cake, my blogger friend Alta of Tasty Eats At Home has. You can read her modifications to my recipe and see her photo here. Enjoy! Hello again – I just couldn’t help myself and write another blog about “Shirley cake.” Of course I included a link to your recipe, so lots more people can take advantage of it. I had a lot of fun and will get back to more blogging – goodness how much I missed those fun times….. I admittedly didn’t read through all the comments, but I have found that oiling the pan and then sprinkling sugar instead of GF flour creates a crispy crust every time. In fact, it is the preference in my family. Also I have tried these as crispy cookies too. Yummy. and it does work great. Admittedly, I kind of like the crispy outside of this loaf without having to add sugar—and this pound cake gives you that on its own—but it’s definitely a great tip! As far as the crispy cookies, I’m not sure I’m following you there. Do you mean you’ve made this pound cake recipe as cookies? Please explain more. On your two ingredient GF flour, can another starch be used? Can’t eat corn! Thanks all your recipes are amazing!! Thanks for sharing!! Hi Dee–It looks like you’re new to gfe—welcome! 🙂 Thanks for the generous feedback on my recipes! I really appreciate it!! While in some cases, one could sub in tapioca starch or arrowroot, for example, I don’t think they would work in all recipes. Some other corn-free ideas that readers have offered in comments on my flour mix post—but ones that I have not personally tried—are using a one to one mix of finely ground white rice flour and potato starch and a mix of three parts finely ground rice flour, one part tapioca flour/starch, and one part sweet rice flour. If you give any of these variations a try, please let us know your results! Hi. Will this recipe work with guar gum? I don’t have xantham gum. Hi Jannah–Welcome to gfe! Personally, I’ve never used guar gum but my friend gluten-free guru Carol Fenster says you can substitute guar gum for xanthan gum any time and do so by using the same amount of guar gum in place of xanthan gum. Hope you enjoy this pound cake! yay, thanks! will make a small test batch today and see if it works then I’ll make it for Christmas eve dinner with the family. Thanks for all that you do. Happy Holidays! My mom is gluten and dairy free so finding things she can eat can be a challenge (although it’s getting easier!). I always struggled with what to make for her birthday. I came across this recipe and had to try it. She LOVES It! I make it every couple of months for her now. I am not gluten and dairy free and even I love this cake. The texture is amazing and the flavor is perfect. I did make a couple of changes. I always use extra virgin olive oil because its what we have on hand. We love the flavor. I also use lemon and add some zest in place of the orange and I add a tablespoon or so of poppy seeds. Delicious! Thanks for the great recipe!! Hi Rachel!–Welcome to gfe!! 🙂 I am absolutely thrilled to hear that you’re making a variation of my Perfect Pound Cake for your mom and she and you all love it so! Please tell me more about your lemon poppy seed version. How much lemon juice and lemon zest do you use? I’d love to try the lemon poppy version! I’m sure your mom will eventually live gf/df without even thinking about it. Son is gf/df and in most baking recipes that require butter I simply substitute in Earth Balance (we prefer the soy-free version, either in sticks or tubs). For milk, canned full-fat coconut milk is our “go to” dairy-free substitute. You’d think it would give a strong coconut flavor but it really doesn’t when you have other ingredients. Plus, I also think you taste the coconut flavor less over time. My coconut-hating BIL doesn’t taste it in recipes I make (unless there’s also shredded coconut present). Thanks so much for taking the time to comment with your fabulous feedback! I hope eating gf/df gets easier and easier for your mom! I use the same amount of lemon juice as the recipe says for orange. So 2 tablespoons lemon juice which I find is usually one lemon. I zest one or two lemons depending on their size. You can’t really put too much! I use 2% Lactaid instead of regular milk. It tastes the same as regular milk and acts the same in recipes. And since we use it all the time I don’t have to buy anything special when I bake. Works like a charm! Thanks so much for the additional info, Rachel! I’ll definitely be trying the lemon poppy seed version soon!